Are Electric Hand Dryers a Hygienic Drying Solution? Due to environmental benefits and cost savings, we certainly see an increasing number of energy-efficient automatic electric hand dryers in public places like restaurants, hospitals, train stations, airports, sports complexes, and malls. So, asking ourselves if these hand dryers are a hygienic way to dry our hands seems plausible. 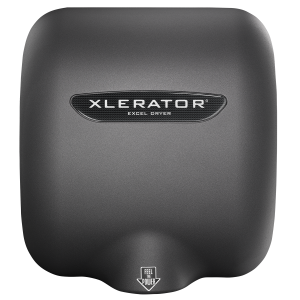 Our immediate response would be an emphatic “Yes,” because we, at Excel Dryer, are committed to providing the most hygienic hand drying solutions. 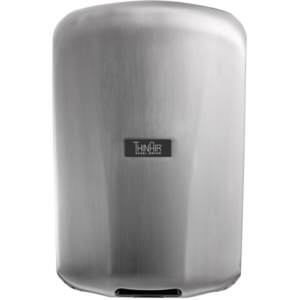 However, we are not the only hand dryer manufacturer; therefore, our answer is, “They can be.” There are, unfortunately, some trough-style hand dryers that studies have shown are not hygienic. Most recently, there was an independent investigation, conducted by CBS Chicago, on the trough-style hand dryer. Following the guidance and protocol of the Loyola Medical Center’s Microbiology Lab, investigators took samples to researchers who found that the grunge and grime located on these DYSON Trough Style electric hand dryers contained potentially harmful bacteria. Doctors also said the DYSON Trough Style hand dryers – filled with grime – are potentially putting bacteria back onto your already washed hands; which could cause your hands to actually be dirtier after using the trough-style machine to dry your hands. So how can electric hand dryers be a hygienic hand drying solution? 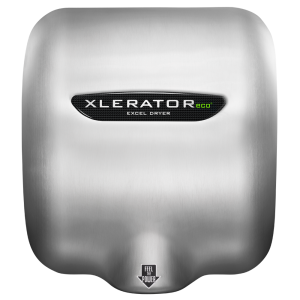 The most important step is to pick a hands-under style dryer like the XLERATOR Hand Dryer, XLERATOReco Hand Dryer, or ThinAir Hand Dryer. These dryers eliminate pooling water often associated with trough-style dryers and reduce the risk of hand dryer bacteria uncovered by the Loyola Medical Center’s Microbiology Lab team. Further, even though hand dryers require much less maintenance than other hand drying solutions, such as paper towels, they do still require a bit of attention. 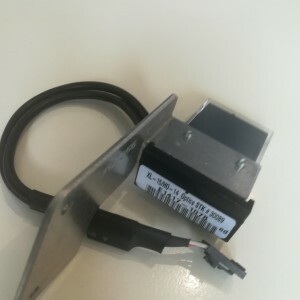 An easy and quick way we found to provide this maintenance “schedule” to our customers is with one of our new features, an externally visible service LED, found on all of our high-efficiency models: XLERATOR®, XLERATOReco® and ThinAir®. 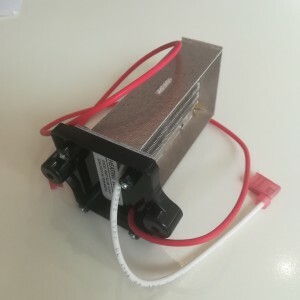 This solution gives our customers a quick and simple way to troubleshoot their electric hand dryer or check to see if the prefilter needs to be replaced. 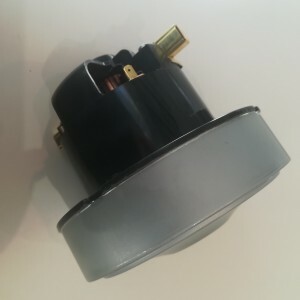 And keep in mind, since our machines are not the trough-style, you won’t have to worry about sticking your hands IN potentially harmful air. So don’t be afraid of every electric hand dryer out there; hygienic hand drying solutions that are environmentally friendly and energy-efficient do exist! 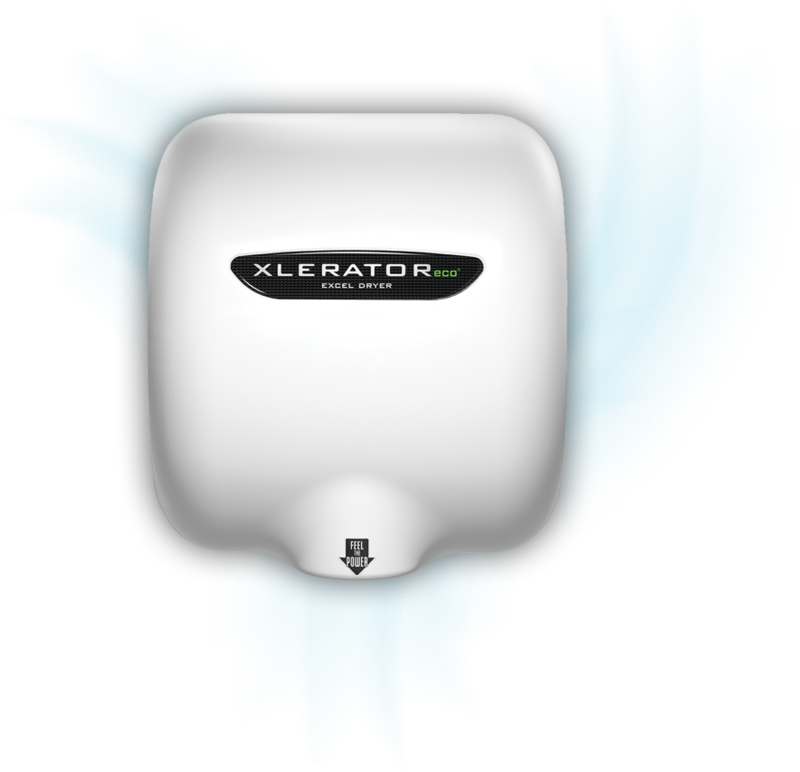 Remember, go under, not in and get your Excel Dryer electric hand dryer today!